If you’ve watched any of my YouTube tutorials, or even follow me on Instagram or Twitter, you’ll know that I love a good contour & highlight. 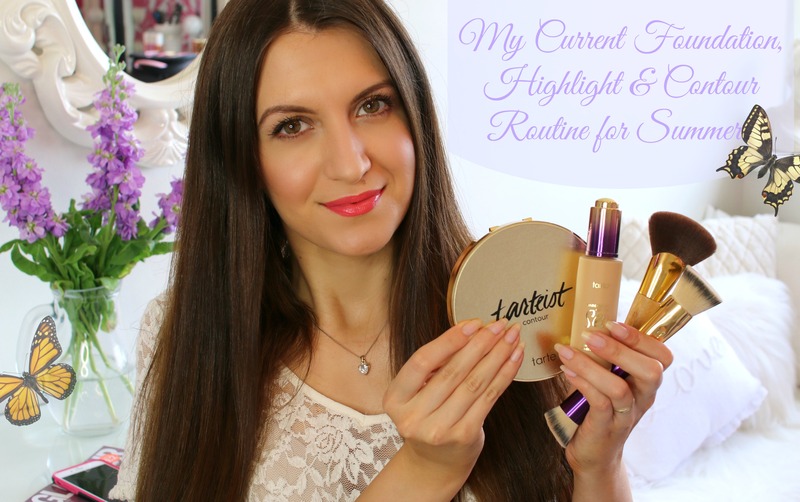 I had a lot of requests on doing a full routine video on it, so I thought I’d film one for you 🙂 It’s also kind of a first impressions video on some new Tarte face products that I will be talking about in todays post. 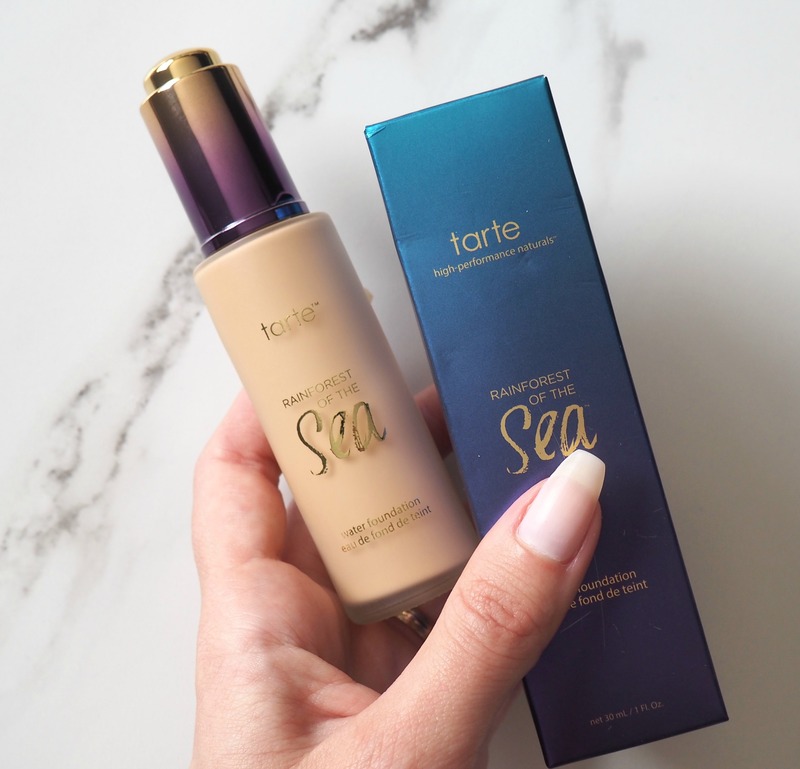 This foundation is really lightweight and hydrating, includes 20% water to quench dry and dehydrated skin. It includes a non-chemical SPF 15 sunscreen which is great for the summer months. 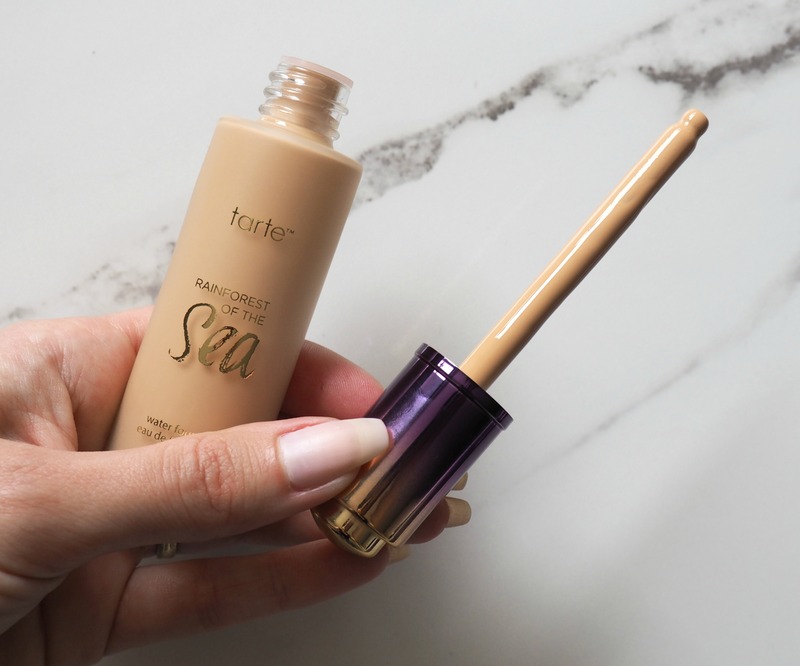 It’s a thin liquid formula that gives a very natural and healthy finish, you can’t really tell that you are wearing foundation it does not cling to dry patches or look cakey. I actually find it quite good on enlarged pores and fine lines under the eyes as it doesn’t seem to settle in and it feels lovely and light on the skin. 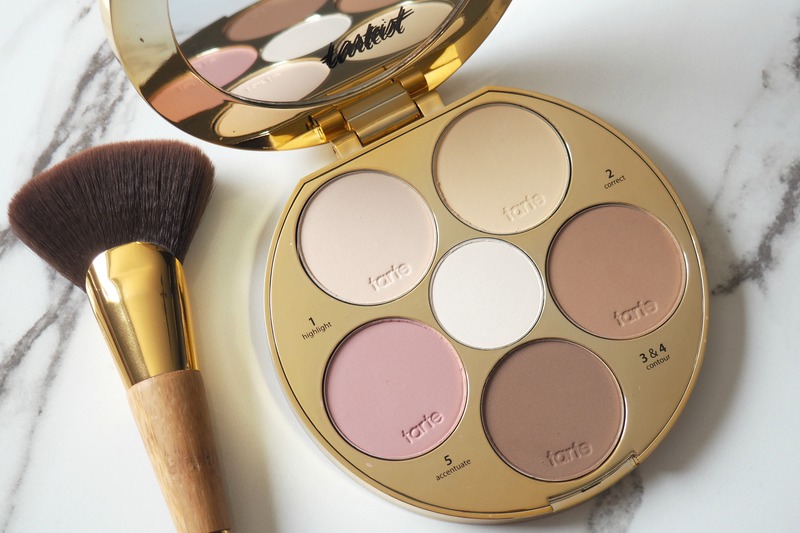 I have been using the new Tarte Tarteist Contour Palette* to contour and highlight and I’m absolutely in love with it. It comes in a large gold compact, Tarte’s packaging is always so lovely and this palette does not disappoint! It comes with a good sized mirror inside and includes six powders which are labeled telling you what they are used for. It has two highlighters, a correcting yellow powder, two contouring bronzing powders, and a blush. The shades are pretty universal and would suit many skin tones, I’m currently using the lighter contouring shade which is perfect for my complexion, the blush is a really lovely warm medium pink that looks very natural. The highlighting powders are soft and silky and do a great job on brightening my under eye area and correcting any darkness. I really like the yellow correcting shade, it actually reminds me of the Banana powder, it works great to set my concealer. This palette will also be great for travelling as it comes with all the shades you’re gonna need, they’re super easy to blend and the texture is very nice and silky. If you have oily skin like me you’ll like the formula of these powders as they really do blend so nicely and last really well on my skin without patching or fading. I also noticed that the powders have a lovely cocoa scent that actually reminded me of the Too Faced Chocolate Bar palette. There’s a little guide card included in the box which is pretty helpful and great guide for beginners. 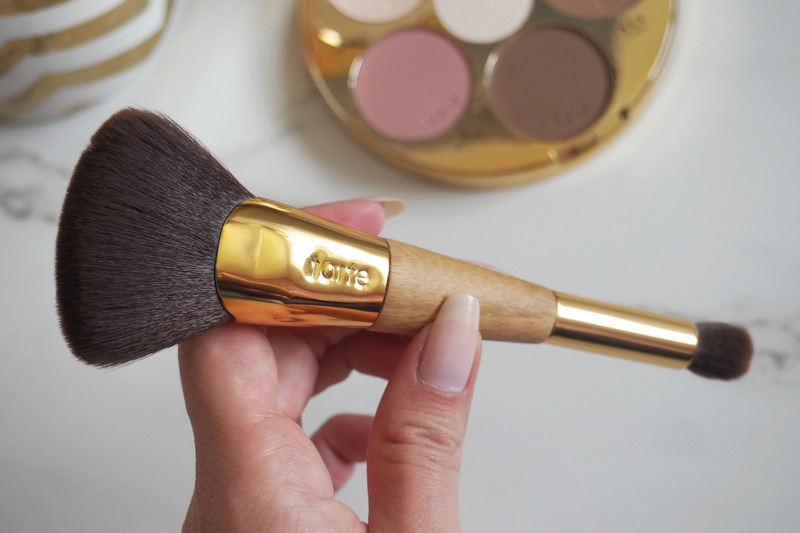 This palette also comes with a dual-ended brush (if you order it from QVC uk) which is really easy to use, very soft and cruelty free and makes it really easy to highlight and sculpt your face. I really want to try the contour palette, it looks great! I always want to try Tarte. Their products seem such good quality. I’m hopeingh to get the in bloom palette. The contour palette looks fab too. Will check out your vid! 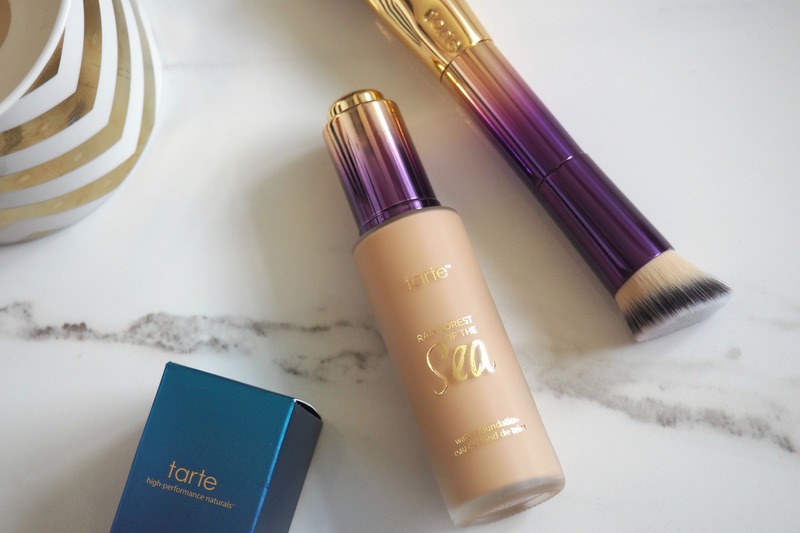 I love light foundations too. 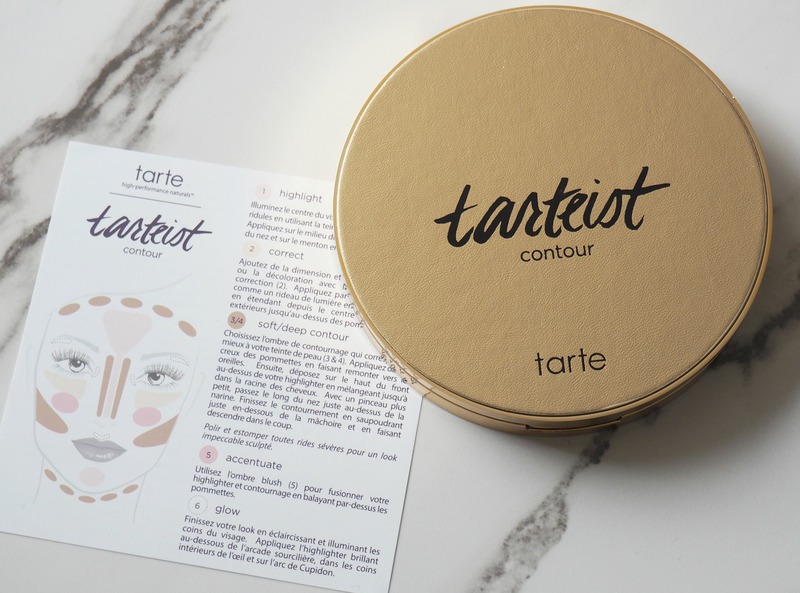 I haven’t tried this tarte one yet but really want to!